Elected April 7, 2001, Dwayne J. 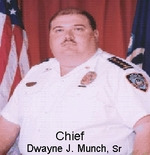 Munch, Sr. is currently serving as Chief of police for the City of Westwego. Born in 1965 the son of Westwego Police Chief David J. Munch and his wife Delta.